Anti-smoking groups and health organizations have long complained of smoking being glamorized in movies and TV programs, and studies have suggested that these depictions can encourage some young people to take up the habit. So what is the propriety of a government agency selling ads with such depictions on its buses? 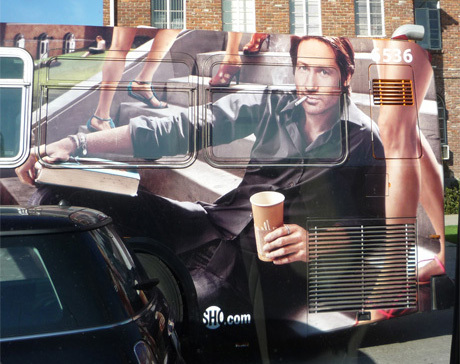 The ad on the above bus depicts actor David Duchovny, star of the TV show “Californication” broadcast on Showtime, a subsidiary of CBS. Coincidentally or not, the MTA entered into a contract last year with CBS Outdoor for these “wraps” and other forms of exterior bus advertising. The agency that operates buses and trains throughout Los Angeles County receives $21 million a year in return. According to the federal government’s Centers for Disease Control, “Films depicting tobacco use are increasing and are reinforcing misleading perceptions that smoking is a widespread, socially desirable, and normal behavior, and they fail to convey the long-term consequences of tobacco use.” Other organizations have called for ending smoking depictions in popular media. One organization that has raised alarms about the possibility that these depictions encourage youths to take up smoking is the American Medical Association Alliance, which tried earlier this year to run billboard ads calling out the biggest offender among movie and TV studios. 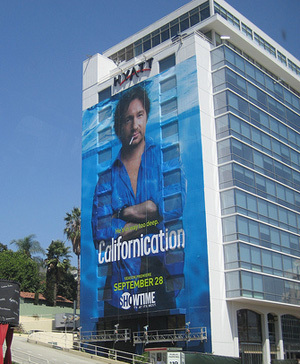 According to the L.A. Times, not a single billboard operator in the city would agree to sell space to the organization. The MTA’s guidelines for advertising on its buses and trains prohibit any ads for tobacco or alcohol, but that prohibition does not extend to depictions of smoking or drinking. Advertising of tobacco products on billboards and other forms of off-site signs has been prohibited since 1999, as part of a lawsuit settlement with tobacco companies.